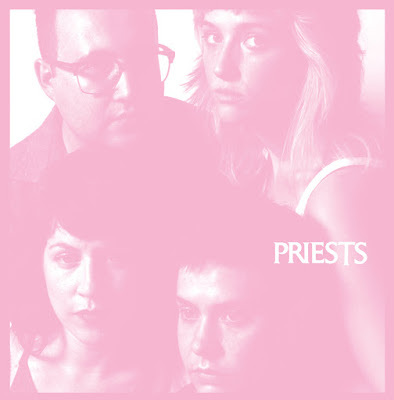 Priests' political vision is also searingly personal on Nothing Feels Natural. If you’ve been involved with feminist and social justice-oriented communities, you’ve likely heard the phrase “the personal is political.” The statement was a rallying call of second wave feminism that was popularized by Carol Hanisch in an essay of the same name. Unlike many of the dictums of that movement, “the personal is political” is still searingly relevant today. We need to think critically about the structures we uphold in our personal spheres, and the ways that we can shift these spheres to dismantle them. Priests is considered by many to be a political band. There’s no denying that the political is intrinsic to their creative project; they rail against the white supremacist, capitalist patriarchy in their songs and urge their audience to take action in the fight against the forces that oppress them. They release their music on their independent label Sister Polygon, they often play benefit shows over more corporatized ones, and they tirelessly advocate for the artists and art spaces in their community. But to label Priests as solely a “political band” and leave it at that ignores the other essential elements that make up their music. On their new LP, Nothing Feels Natural, it becomes clear that Priests’ political vision is also personal. On first single “JJ,” Katie Alice Greer focuses her fury on the kind of men who date models and secretly thrive off being taunted because their lack of traditional masculinity exempts them from being held accountable for mistreating women. Perhaps this kind of anger is less purely righteous than the overtly political sentiments that drive songs like “Pink White House” and “Appropriate,” but it's just as immediate, just as visceral. The weak confidence that drives statements like “I thought I was a cowboy because I smoked Reds” and the devastation that enters KAG’s voice as she wails, “You thought I was disgusting,” over frantic piano keys and G.L. Jaguar and Taylor Mulitz’s throbbing guitar and bass lines are about as affecting as it gets. Although investing your identity in a brand of cigarettes isn’t exactly revolutionary, it’s driven by an urgency that is far from apolitical. Whether your enemy is the NSA or the frequent "soft boy" facade, expressing your emotions with an unbridled intensity is a radical act. And expressing emotion is Priests’ forte. “JJ” is not the only the only song on Nothing Feels Natural that finds KAG asserting herself over the people who've wronged her. On the album’s stunning title track, she questions god and reality in an attempt to carve out a space in the world for her existence. “If I walk a hundred days” she wonders, “Does it mean I get to say you can’t talk to me that way?” On “Nicki,” she takes ownership of her uncontrollable nature, her stubbornness, and lack of ability to make friends easily. “Got more appetite than a bear or a forest full of mouths to feed / So save your paltry dowry / I’m gonna buy you before you buy me,” she shouts, and it’s impossible not to believe it. More than just being about asserting yourself in a toxic political and social climate, Nothing Feels Natural is also a testament to the power of community. The album features five different guest musicians, all members of the Washington DC punk scene, and was produced, engineered, mixed, and mastered by friends. On “Puff,” a friend who wants to start a band called “Burger King” provides lightness to a fairly bleak song about the dangers of accelerationism. Although the members of Priests know that the personal is sometimes a site for further subjugation, they also see its potential to be a space to uplift. Eva Silverman is a NYC/DC based writer and Libra. She enjoys experimental feminist literature, dogs, and Buffy the Vampire Slayer. She plays music occasionally as default handshake. You can follow her on Twitter and email her at evogirl98@gmail.com.